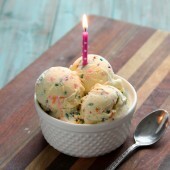 The perfect birthday or celebration ice cream, cake batter and sprinkles create a rich cake flavor in this easy frozen treat. We have a string of summer-time birthdays in our family. Out of the five of us, I’m the only one who doesn’t have a summer birthday. The girl who isn’t a fan of cold gets stuck with a winter birthday, go figure. I made this ice cream a month ago, or nearly a month ago for my oldest daughter’s birthday. She requested “the orange ice cream” (aka orange creamsicle ice cream) again, but I couldn’t resist the opportunity to make a special birthday related ice cream instead. Don’t get me wrong, I loved the creamsicle ice cream, but I had been waiting for the perfect moment to make a cake batter ice cream … of course loaded with sprinkles too. 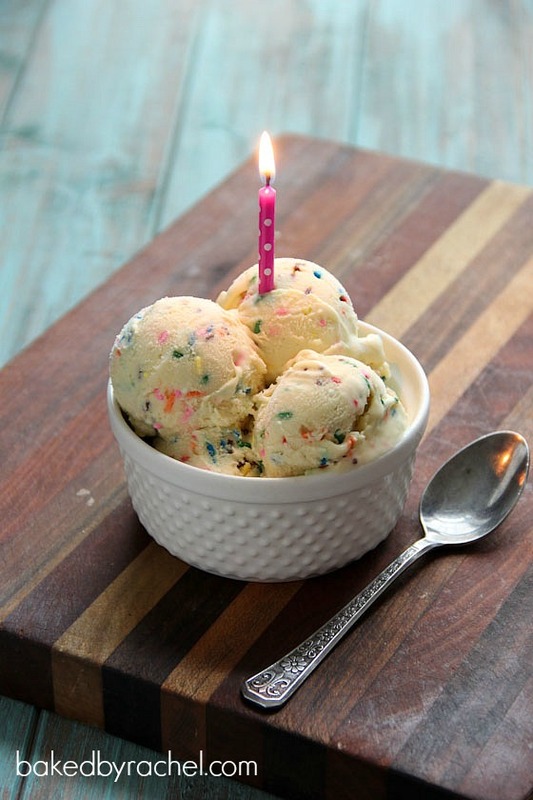 Because what’s birthday cake ice cream without sprinkles? That’d be a truly depressing ice cream if you ask me. Totally subpar. And you know what? She totally didn’t complain. Not one bit. In fact, she loved it. I’m positive you will too! Yesterday also just happened to be the Mr’s birthday, so it seems fitting to finally share this ice cream… even though we didn’t have any of this to enjoy this past weekend. I did however whip up a total cheater cake. Sometimes you just have to. But I seriously wish I had some of this ice cream. Nothing beats homemade ice cream… except apple pie. Apple pie will win every time in my book. This is a very vanilla, creamy cake batter ice cream, loaded with sprinkles and optionally topped off with homemade sweetened whipped cream… and more sprinkles. Because more sprinkles are always and forever totally necessary. In a small bowl, whisk egg yolks. Pour one cup heavy cream in a medium bowl, with mesh strainer set on top. In a medium saucepan, combine whole milk, remaining 1 cup heavy cream, sugar, salt, vanilla and cake mix. Cook over medium-low heat, stirring until smooth and then occasionally, until heated through and just steaming. While whisking the yolks continuously, slowly drizzle a quarter of the hot liquid into the yolks. Pour egg mixture into saucepan. Continue cooking until the mixture coats the back of a wooden spoon. Pour through mesh strainer into heavy cream. Cool over an ice bath. Transfer to the refrigerator to chill completely prior to churning, 4-6 hours or overnight. Churn according to manufacturer's directions. In the last 5 minutes of churning, slowly add rainbow sprinkles. Transfer to a freezer safe container. Freeze until solid. This sprinkle loaded ice cream has my name written all over it! I’d love a huge bowl of it for breakfast. :) Homemade apple pie and homemade ice cream – YES! Two of my favorites. Apple pie will always win for me too, though. Such a perfect bday treat! I can see grown ups and kiddos a like getting very excited about this. I mean, be real: Who doesn’t grin when they see SPRINKLES! Ok, that looks perfectly creamy and delicious! How incredible is this?!!! Two bowls for me please! What a fun way to celebrate! Wish I could have a bowl for breakfast! 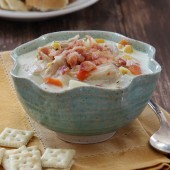 This look perfectly creamy, perfectly colorful and just perfectly awesome!! So my kind of fun ice cream!! This looks so good! I made cake batter funfetti ice cream about 6 weeks or so ago. I added Golden Oreos to it. I bet the cake mix in yours gives it such a great flavor. Happy Bday to your lil girl! I still haven’t tried those golden oreo’s. 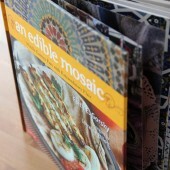 I’ve got to add them to my list to try sometime soon! So many birthdays to celebrate and you picked a great treat to celebrate them. This recipe looks great, but serving four to six is not Nearly enough in my household. Each family member’s bowl of ice cream consists of scoop after scoop after scoop, etc., until the bowl is piled high with ice cream. No polite one-scoop for us! As this is the case, if I make this in my one-gallon ice cream maker, will I only be filling the container half full? a quarter full? I wonder if you could tell us how much your ice cream recipes make – i.e., one gallon; 1/2 gallon, etc. – instead of how many they serve… Thanks! Hi Wendy – I actually linked to the ice cream maker I use, at the bottom of the post. It makes up to 1 1/2 quarts but every batch varies slightly. Yum! We have a ton of birthdays toward the end of June beginning of July–its a little crazy how many birthdays we have to celebrate in a 2 week time span! This ice cream looks divine. Isn’t it crazy how everything always seems so bunched up and then there is nothing? Holy yum! I have a weakness for cake batter desserts! I’m stuck with a winter day too. My kiddos just celebrated their bday last week. I just may need to celebrate one more time with a batch of this incredible looking ice cream! This ice cream! This is the perfect birthday treat. Who needs cake when the ice cream is this good! Right?! Ice cream always wins. Oh sprinkles. How could this not be the best birthday ice cream ever!! Love it. I love love love cake batter anything, so I know I’d be all over this ice cream. It looks SO good! Thanks Amy. I guarantee you’d love this! You know this is brilliant, right? 50 gold mitts for you, friend! 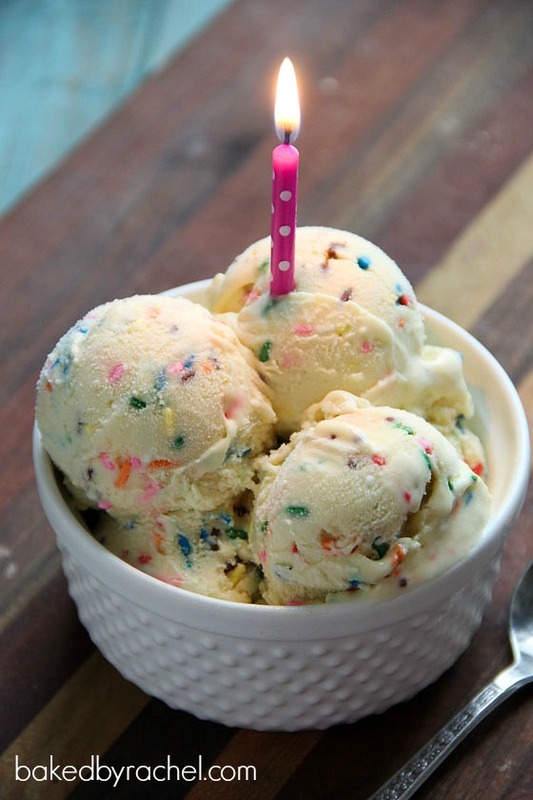 I would choose this sprinkle loaded ice cream over cake any day of the week! How beautiful that bowl of ice cream is! Love it and want some!!! I would be in trouble with a batch of this in front of me. I have no self-control when it comes to sprinkles and cake mix! I always wished I had a summer birthday! There would be so many more options for things to do for it :) This looks amazing! I want a huge bowl right now! I know!! Way more things to do in the summer vs winter… unless you’re a snow bunny or something but that’s totally not my thing. Yum! This looks absolutely delicious and so fun. The photos are beautiful, too! Even thought it is winter here in the Land Down Under and is COLD brrrrrrrr, true! 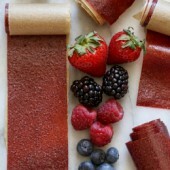 I could go for one of these now as looks delish too! I love ice cream in every form and always requested an ice cream cake for my birthday growing up. I think this ice cream in any of those cakes would have been perfect! Ohhh yum. Cake batter anything is totally my jam. What a fun birthday treat! I haven’t had this kind of ice cream in a long time. I say it’s about time to remedy that. I remember the first time I had cake batter ice cream at Maggie Moo’s on a visit to Nashville several years ago. I’ve been hooked ever since. It blew my mind. Can’t wait to try this one. LOVE this ice cream. Cake Batter has always been a favorite!! I followed the recipe this weekend and it was awesome! Thanks! I was hoping you could explain to me why you left that 1 cup of heavy cream unheated for mixing at the end? All ice cream recipes I’ve seen heat all of the cream. What’s the “physics” behind that? Thanks again, sooooo good!